It is easy to find out the entrance of the marina, once you close to 34 09.700N　135 10.400E. The marina for sailing boats is named as Wakayama Marina City Yacht Club. See “Additional Information for English Version” below. At first, put your boat at a pontoon for fueling running from east to west. Then go to the harbor office for check-in; and move your boat to the visitor berth in the south, which is wide and open. It is calm with no wave or no rolling. Toilet is inside the harbor office which is open daytime. At night, use a public toilet at the opposite side of a road of a bathhouse which is in front of the visitor berth. There is a coin laundry which has a small good dryer machine in the harbor. Provisions: Shops have vegetables and fishes. No big supermarket. Fuel is available in the harbor. A big Onsen, or hot spring, bathhouse is next to. No water or no power is at the visitor pontoon. You have to walk to the harbor office. 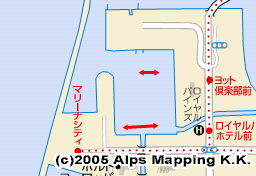 It is a long walk because of a bad layout design of the marina ! 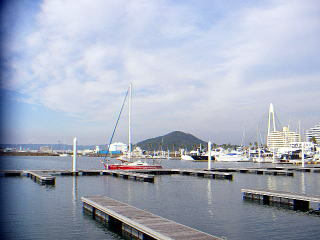 The marina for sailing boats is named as Wakayama Marina City Yacht Club.